It's that time of year again. A time to look back at my adventures and photos of 2013 and pick my best. Here are my top ten photos of 2013, in no particular order. Just another incredible moment at Lake Tahoe. I loved the soft pastel purple light, the boulders, and the moon in this one. Also, I got to shoot it with my good friend Tony Spiker of Spiker Photography. You can check out a 30"x40" print of this one at Tony's Vista Gallery in Kings Beach. 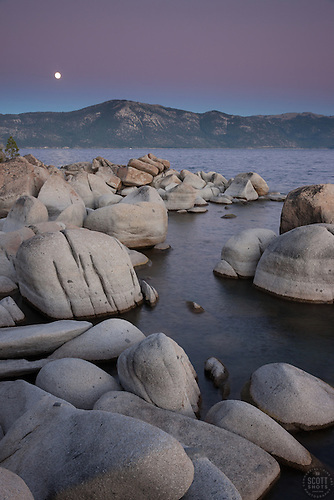 "Full Moon Over Lake Tahoe 12" -These boulders, full moon, and alpenglow sunset were photographed at Crystal Point in Crystal Bay, Lake Tahoe. I've shot this old shack many times. And on occasion, when the first snow falls and the aspen still have their yellow leaves, I drive up to the spot and shoot it before the snow melts. The visit this year provided for some great photos. 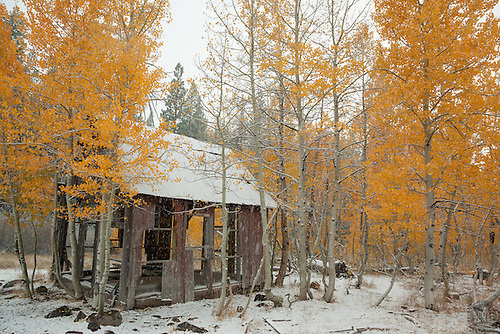 "Shack in the Aspens 4" - Photograph of yellow leaved aspens and an old shack near the summit of Hwy 267 in Tahoe. Shot in the fall while it was snowing. An incredible sunset that seemed to last forever. Lots of fun to shoot this one. 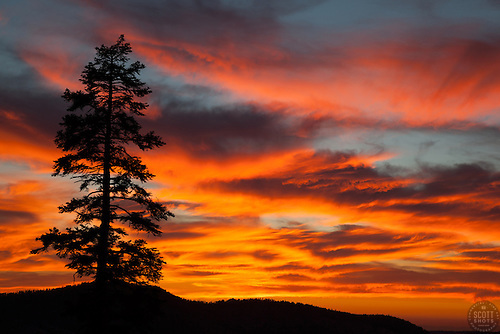 "Blackwood Canyon Sunset 1" - Photograph taken in Tahoe's Blackwood Canyon of a pine tree and mountain silhouette with a beautiful fiery orange and yellow sunset background. The golden pebbles and blue Tahoe waters and sky went so nicely together in this shot. This one looks great in print. 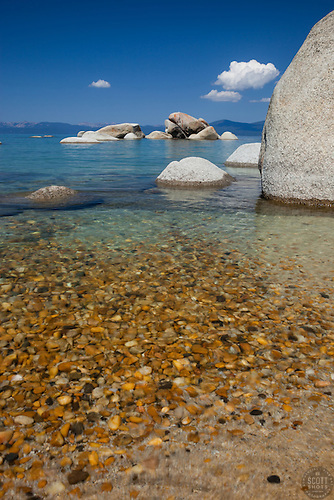 "Pebbles at Whale Beach 3" - These pebbles were photographed along the shore of Whale Beach on the East shore of Lake Tahoe. Whale Rock can be seen in the distance. 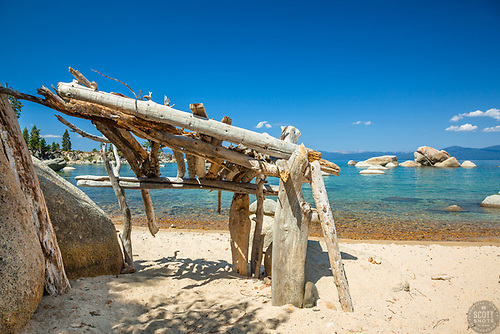 "Stick Shelter at Lake Tahoe" - This little shelter made of driftwood and sticks was photographed at Whale Beach on the East shore of Lake Tahoe. 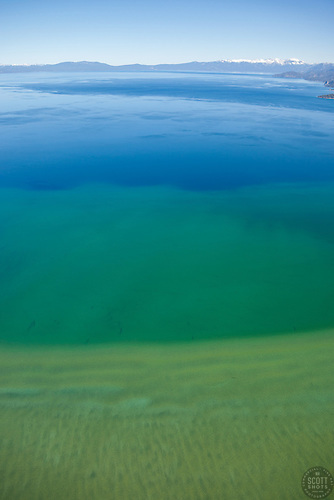 Lake Tahoe's blue, aqua, emerald, and green waters are incredible. Secret Cove is a great place to capture the colors. Oh, and a 30"x40" print of this one is currently available at Art Obsessions in Downtown Truckee. I think it looks pretty nice. 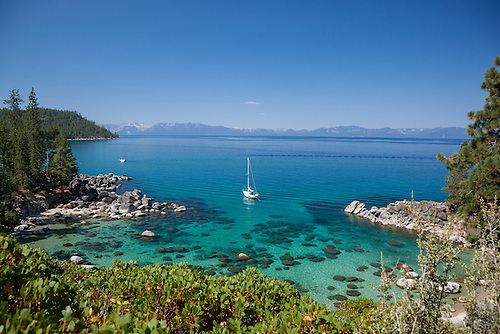 "Secret Cove, Lake Tahoe" - Photograph of a sailboat at Secret Cove on the East shore of Lake Tahoe. It's hard to go wrong with Lake Tahoe aerial photography. This abstract shot shows the progressions of colors as the water gets deeper. Pretty cool. "Lake Tahoe Aerial 5" - Aerial photograph of Lake Tahoe shot from a helicopter with the door removed. Anther Lake Tahoe abstract aerial. The Upper Truckee Marsh and blue waters made for a really fun and unique Tahoe photo. 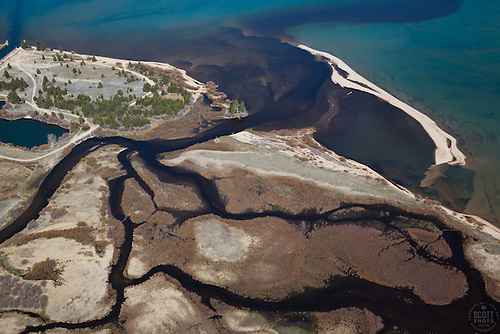 "Upper Truckee Marsh and Tahoe 1" - This abstract like photo of the Upper Truckee Marsh, shoreline, and Lake Tahoe was photographed from a helicopter. I had been wanting this shot for years and finally got it. Tony Spiker and I hiked up a steep mountain across from Squaw Valley Ski Resort to get this and the hike was worth it (he got a great shot as well). 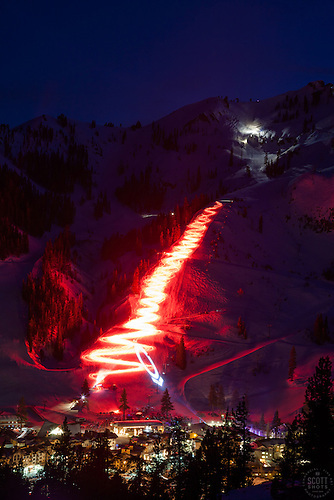 "Squaw Valley Torchlight Parade 1" - Long exposure photograph of the torchlight parade at Squaw Valley Ski Resort. Multiple skiers hold torches at they ski down the mountain. Thanks to apps like Golden Pic and Google Sky Maps, I was able to "predict" this moon rising in the perfect location over Downtown Truckee at sunset. Truckee is always beautiful but this time of year can be magical with all of the Christmas lights (and sometimes snow). 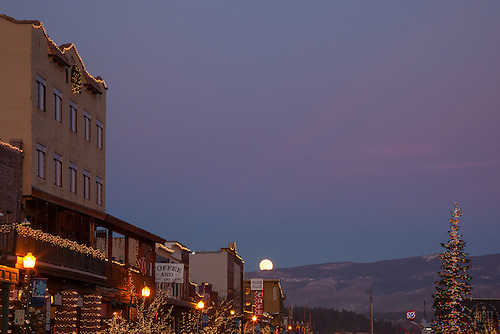 "Moon Over Truckee 1" - Photograph of a moon rising over Truckee at sunset. An alpenglow sunset and Christmas lights compliment the moon. There you have it, my top ten photos of 2013. Please click on individual photos for larger views and purchasing information. Available as large fine art prints, photo gift items, and as stock photography.